With my wife Michelle standing on a thousand year old balcony in front of Saint Marks Basilica in Saint Mark’s Square, Venice. Last May, many of you know I experienced the trip of a lifetime-taking my wife to one of my favorite places on the planet: Italy. The trip ended in Venice, a location I had not been to yet. What I experienced there has left a mark on me. Literally, a Saint Mark on me. When the founding merchants of Venice started binding freshly cut tree trunks in threes, dropping them into the mud under the Adriatic, and covering them in stone to create a foundation, it was about 700 AD. They knew that the position of this “City on the Water”, with a listed elevation of 3 feet above sea level to this day, was destined to be an economic super-power. It’s location between the goods of the East and Europe in the West would make it the first international financial center in the world. All they needed to seal the deal was a Relic. 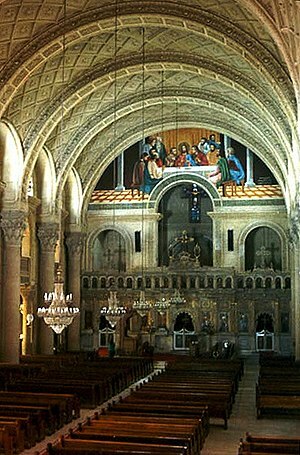 This is the original Saint Marks in Alexandria Egypt, a church that came from a Christian community Mark himself created in the 1st century. In 828, leading men of the city were sent on a clandestine mission to the city of Alexandria Egypt to a church that was already 700 years old; Saint Marks. Saint Marks was founded after Mark (of Matthew, Mark, Luke & John fame) finished writing the first biography of Jesus every written. Peter, realizing that those who knew Jesus were quickly leaving the earth in one way or another, decided the knowledge of Jesus could not be contained by a few aging mortal men so he dictated his knowledge of Jesus to Mark who transcribed it and quickly distributed it all over the Roman Empire during the middle of the 1st century. Mark then went to Alexandria, founded a Christian community, and got beaten to death by those opposing his message. He was lovingly buried by the believers there and a church was built on his grave. Two years ago on Palm Sunday, you may remember that this church was bombed by Isis. 14 Christians were killed in the bombing but the current building remained. Back to 828 AD. Islam was spreading across the Middle East and Northern Africa. Churches were becoming Mosques and graves of saints like Mark were being desecrated. Enter the opportunistic merchants of Venice. They explained to the clergy what would likely happen to their church and the remains of their patron saint should Islam take full hold of Alexandria. If they would only give the remains of Mark to them, they would keep him safe and give him a new home in the soon to be super-power on the sea across the Mediterranean. After a few days of thinking about that, they gave these merchants the remains of Mark, packed them gently in ham (so that no devout Muslim would touch them), and made their way back across the sea to what would soon be called “Saint Mark’s Square” in the center of Venice at the entrance to the Grand Canal. Michelle took this photo of Saint Mark’s Basilica in the reflection on the tide waters coming up from underneath the stilts that hold the whole city up. What happened next created the reason for my telling you this story today, especially with Easter just around the corner. They built a church to house Mark’s remains that was severely damaged in a fire that started in the palace next store. So with their staggering wealth, they rebuilt the Doge’s palace and began creating Saint Mark’s Cathedral around 978 AD. I have wanted to see this church for 2 decades when I first discovered its significance. So when my wife Michelle and I arrived in Venice, I could hardly contain my enthusiasm. 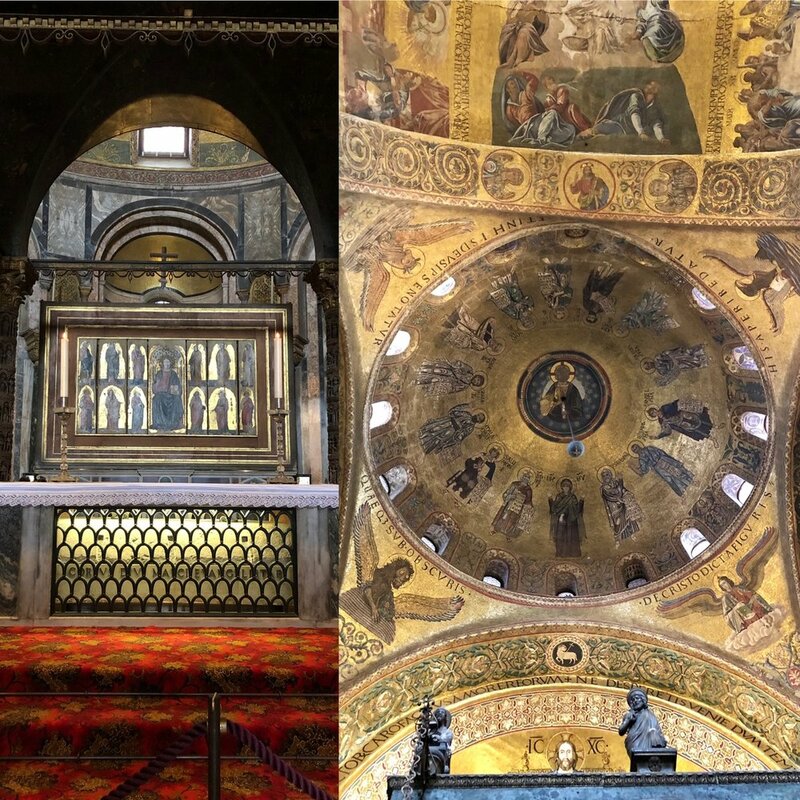 You see, Saint Mark’s in Venice was built before there was a such thing as stained glass so their way of telling the stories of the Bible (and the story of how Mark got to Venice) are portrayed in gold mosaics. It is stunning. Every story in the Bible is embedded in this church, but I wanted to find a different prize…I wanted to find Mark. “He’s here someone honey, I know it”, I told Michelle. I figured he’d have to be somewhere on or around the altar. When I got up there, there was Mark in a stone sarcophagus. No one seem to even know he was there. It was like nobody here knows who he is anymore. I, on the other hand, yelled “Dude….I read your book!” It took everything in my to not slide the stone lid enough to see if a bony hand could sign my Bible. Here are two photos we took once we found Mark. LEFT: Mark in his sarcophagus on the altar. RIGHT: The dome right above it with the symbols of each gospel in the corners. It was then that two dots connected that blew me away. I looked straight up and saw this dome with four symbols at each corner. I recognized them immediately. The Lion was how Mark saw Jesus. Victorious. Then the dots slowly connected. I had been staring at lions everywhere. You cannot stand and do a 360 anywhere in the city and not see 4 or more of them. They are on top of pillars, on clocks, on facades, on corners and on flags. It’s even all over the Venetian in Las Vegas-a lion with an open book in its paws with these words: "Pax tibi Marce, evangelista meus", meaning "Peace to you Mark, my Evangelist". 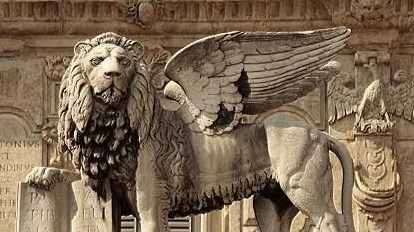 Literally the symbol of Venice, the Venetian Lion, is Jesus as seen through the eyes of Mark. I just had to become Robert Langdon from the DiVinci Code to figure it out. As we approach Easter this year (yeah, I’m landing the plane now), I wonder how hard it will be for someone visiting our churches to figure out this is all about Jesus. We are quick to judge medieval churches and artists for the ornamentation and cost of their facilities. I wonder what they would think about the investment we have made in comfortable chairs, cafes, light shows, sound systems and fog machines. I am not saying any of it is bad. What I think it would be good to do is ask ourselves how easy will it be to recognize Jesus in our Easter celebration this year? I just shot my inner preacher. He’s done. But instead, I’ll invite the spirit of teaching to attempt to learn some things from Mark that we may have never thought of before. I call my tribe “Sherpas” because we have purposed to help people make the climb toward full connection with God and others. So what can we as Sherpas learn from Mark this Easter? 1. Even if you are not a great leader, you are good at something that can change the future. Mark ran away naked from Jesus’ arrest (Mark 14:51-52). He never wrote anything that wasn’t dictated from someone who knew Jesus more personally then him. On his first mission trip, he got overwhelmed and abandoned the team, becoming a source of contention between 2 leaders he and the rest of his community respected. Not the resume of a great spiritual leader applying for a job at your church. But he did not give up. He knew how to read and write. He helped Peter in a dark hour and his book gave him the platform to start a Christian community that still exists to this day in Alexandra Egypt, 2000 years later. Mark changed our world. He changed your world and the Jesus he followed and gave to us in written form is all we really have to change someone else’s world this Easter. 2. People will be impacted forever by how you see Jesus. Mark saw him as a Conquering Lion. How do you see him right now? Can you see him clearly? I know you can’t see him completely, none of us can. But what is clear to you about Jesus these days? What is he most like to you? How has he made that known to you in the course of your life? Journal that. Know it like you know anything. Share it in writing, teaching or conversation with those who will greet guests, interact with them before and after your services. If you are a teacher or charged with planning the service or with preaching, let that Jesus loose. Guest Central last weekend at my church. 3. It takes energy to remember who He really is, who we really are and where we really came from. Ahead of weekends like Easter, we spend a lot of time planning our services, training our teams, making sure our processes for welcoming and connecting people are working, rehearsing music, constructing stages and technology and these are important-they are like the paper and pen that Mark used to give us Jesus. But they are not Jesus. Unless we save some of our best energies to bring Him and to be Him for each other and for those God is drawing to our churches this Easter, all we have is a bunch of gold, animals, images, loud music, fog and skinny jeans...and we all might forget that the lion we see everywhere is really Jesus. Bottom line: we don’t need a relic to get things moving. We need someone who is alive. In light of all this, would you join me in declaring these words from a worship song these next 2 weeks so we can be full of Jesus this Easter for ourselves and our guests? -from ANOTHER IN THE FIRE, Hillsong United. Go somewhere alone and read the words to Another In The Fire. What words or phrases jump out at you? Why? What is going on inside you that makes those phrases or words stand out to you? Ask your team what the message is that you are trying to get across as a church this Easter. Write down all the answers. Does it connect with your plans for Easter? Anything missing? What is the common thread? What is core? What are 1 or 2 ideas for reserving energy to bring Jesus to your guests and each other this Easter?